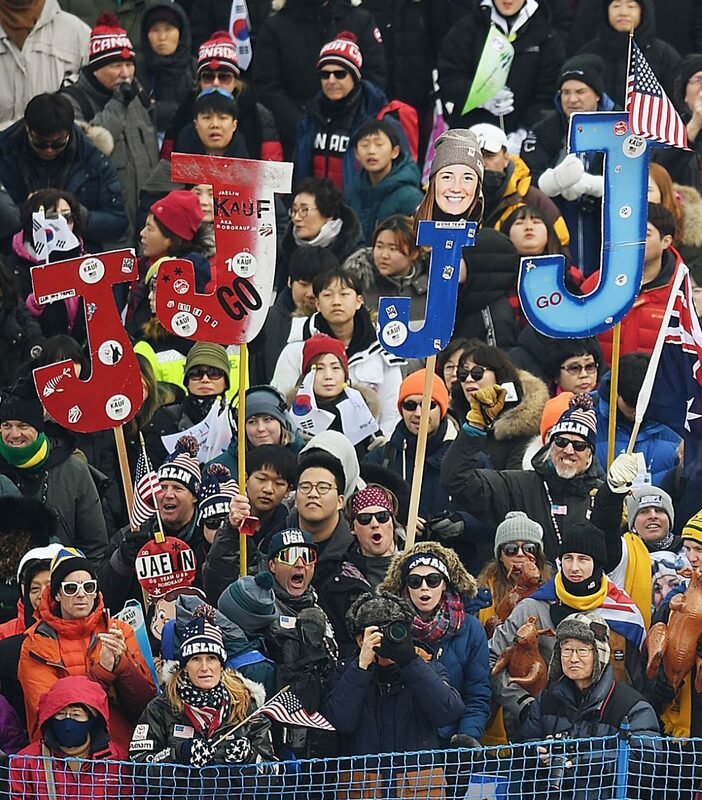 Jaelin Kauf’s expansive fan base cheers her on as she begins her first run in the women’s moguls competition Friday at the 2018 Winter Olympics at Bokwang Phoenix Park, South Korea. 1. Mikael Kingsbury, Canada, 86.07 (Q). 2. Aleksandr Smyshliaev, Russia, 83.93 (Q). 3. Dmitriy Reikherd, Kazakhstan, 81.23 (Q). 4. Troy Murphy, United States, 80.95 (Q). 5. Ikuma Horishima, Japan, 80.35 (Q). 6. Daichi Hara, Japan, 80.01 (Q). 7. Pavel Kolmakov, Kazakhstan, 79.98 (Q). 8. Philippe Marquis, Canada, 77.77 (Q). 9. Matt Graham, Australia, 77.28 (Q). 10. Sacha Theocharis, France, 76.55 (Q). 11. Marc-Antoine Gagnon, Canada, 76.32. 12. Anthony Benna, France, 76.28. 13. Sho Endo, Japan, 75.73. 14. 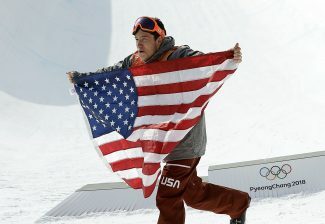 Casey Andringa, United States, 75.25. 15. Bradley Wilson, United States, 75.25. 16. Nobuyuki Nishi, Japan, 75.17. 17. Rohan Chapman-Davies, Australia, 73.96. 18. Felix Elofsson, Sweden, 73.85. 19. Walter Wallberg, Sweden, 73.61. 20. Choi Jae Woo, South Korea, 72.95. 21. Benjamin Cavet, France, 72.74. 22. Emerson Smith, United States, 72.59. 23. James Matheson, Australia, 72.27. 24. Kim Ji Hyon, South Korea, 69.85. 25. Ludvig Fjallstrom, Sweden, 68.57. 26. Seo Myung Joon, South Korea, 68.45. 27. Jimi Salonen, Finland, 43.18. 28. Jussi Penttala, Finland, 30.15. 1. Perrine Laffont, France, 79.72 (Q). 2. Andi Naude, Canada, 79.60 (Q). 3. Morgan Schild, United States, 77.74 (Q). 4. Justine Dufour-Lapointe, Canada, 77.66 (Q). 5. Jaelin Kauf, United States, 77.45 (Q). 6. Britteny Cox, Australia, 76.78 (Q). 7. Yulia Galysheva, Kazakhstan, 76.36 (Q). 8. Keaton McCargo, United States, 75.67 (Q). 9. Arisa Murata, Japan, 74.13 (Q). 10. Audrey Robichaud, Canada, 72.48 (Q). 11. Regina Rakhimova, Russia, 71.77. 12. Marika Pertakhiya, Russia, 70.43. 13. Chloe Dufour-Lapointe, Canada, 69.53. 14. Jakara Anthony, Australia, 69.49. 15. Madii Himbury, Australia, 68.98. 16. Camille Cabrol, France, 68.89. 17. Claudia Gueli, Australia, 68.68. 18. Hedvig Wessel, Norway 68.64. 19. Seo Jee Won, South Korea, 68.46. 20. Ekaterina Stolyarova, Russia, 67.69. 21. Deborah Scanzio, Switzerland, 66.38. 22. Tess Johnson, United States, 65.55. 23. Katharina Foerster, Germany, 63.17. 24. Lea Bouard, Germany, 55.71. 25. Melanie Meilinger, Austria, 54.95. 26. Ayaulum Amrenova, Kazakhstan, 52.78. 27. Wang Jin, China, 51.29. 28. Guan Ziyan, China, 48.11. 29. Tetiana Petrova, Ukraine, 46.19. 30. Seo Jung-Hwa, South Korea, 16.57. 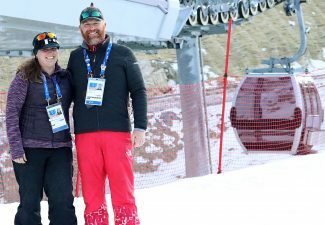 BOKWANG PHOENIX PARK — Step one is out of the way for Jaelin Kauf, the Park City moguls skier chasing Olympic gold at the 2018 Winter Olympics. 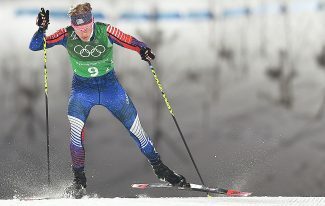 Kauf, the top-ranked women’s bumps skier in the world, placed fifth in the women’s moguls qualification event at Bokwang Phoenix Park, South Korea, good enough to advance to Sunday’s finals rounds. The athletes with the 10 best scores from Friday’s one-run qualifier automatically move on to the next round, which will feature 20 athletes. The 20 athletes in Friday’s competition who didn’t make the top 10 will get one more chance, also on Sunday. The top 10 from that group will move to join Kauf’s group for the first round of finals. They’ll take a run with the top 12 advancing, then those 12 will run again with the top six advancing. Finally, those six will slug it out for the medals Sunday evening. 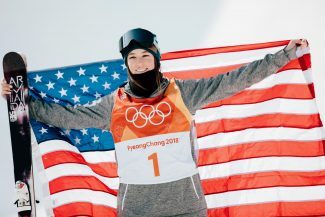 Kauf’s expansive fan base cheers her on as she begins her first run in the women’s moguls competition Friday at the 2018 Winter Olympics at Bokwang Phoenix Park, South Korea. Kauf was joined Friday in advancing by two teammates, Morgan Schild, who placed third, and Keaton McCargo, who was eighth. 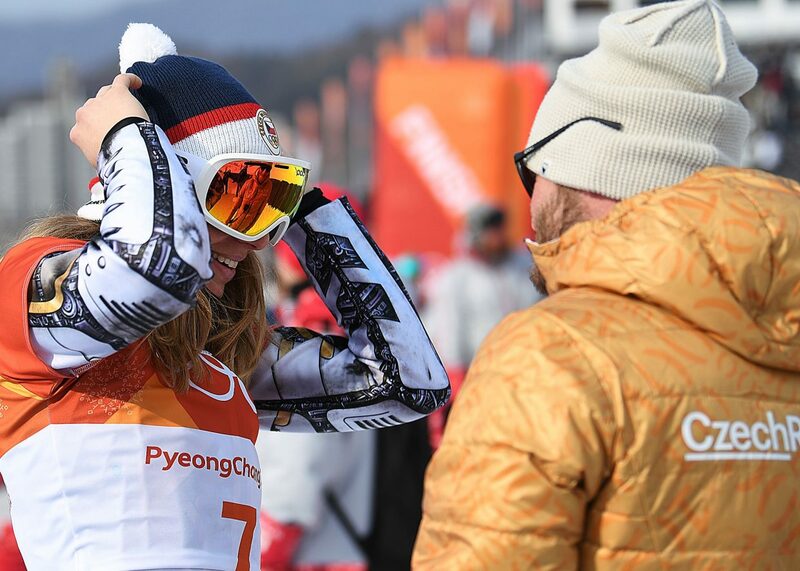 The fourth American, 17-year old Vail skier Tess Johnson, was 22nd after having trouble off her top air. She’ll get another chance Sunday to move on. France’s Perrine Laffont was the top qualifier with a score of 79.72. Canada’s Andi Naude was second at 79.60 and Schild third at 77.74. Defending gold medalist Justine DuFour-LaPointe, from Canada, was fourth at 77.66 and Kauf was fifth at 77.46. Kauf had the second-fastest time of the group, but lost some ground on her jump scores and her turns. Britteny Cox, Australia’s defending world champion, was sixth, Kazakhstan’s Yulia Galysheva seventh, McCargo eighth, Arisa Murata of Japan ninth and Audrey Robichaud of Canada 10th. The women will be back in action Sunday starting at 3:30 a.m. mountain time for the second qualifying run where Johnson will attempt to earn her spot in the finals. The first round of finals will start at 5 a.m. The U.S. men didn’t fare as well in their first round. Troy Murphy qualified into finals with a fourth-place finish. Casey Andringa, the Boulder skier who spent last summer camping in Steamboat Springs to save money for his Olympic bid, was 14th, Bradley Wilson 15th and Breckenridge’s Emerson Smith 22nd. Canadian moguls monster Mikael Kingsbury was the top qualifier, ahead of Russia’s Aleksandr Smyshliaev in second and Kazakhstan’s Dmitriy Reikherd in third. The men’s competition will follow the same format and resume Monday.